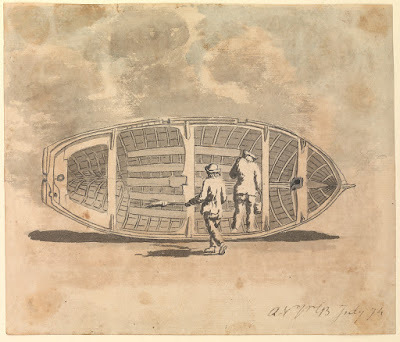 "Seamen painting a jolly boat," Gabriel Bray, 1774, National Maritime Museum. 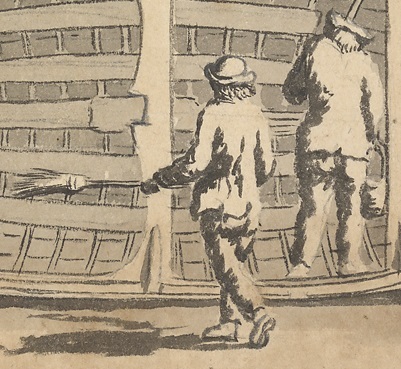 Painted prior to his voyage on the Pallas, Bray depicts a pair of sailors at a fairly mundane task ashore. Beyond the clothing, this piece is notable for showing us a fairly detailed interior of a jolly boat. The sailor on the right wears a cocked hat pointed forward. His jacket ends just below the waist and has a single shallow vent in the middle of the back. The trousers extend to the ankle. Beside him on the left is a tar in a round hat or a knit cap. He too wears a jacket extending to just below the waist, but there appears to be three vents along the back. His trousers are just as long as those of his mate, and he wears a pair of rounded toe shoes.